Just wanted to share this technique of the framed butterfly. This is my first attempt at this frame, but I will be making many more, it's so simple! 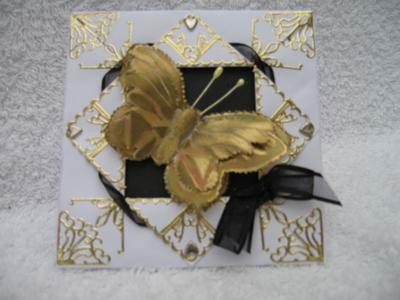 Parchment butterflies look wonderful on cards, and almost look ready to flutter away. The humble peel off is always a good way to add glamour to your cards and these have been put to good use. This is a second attempt at the framed butterfly in black and white this time. It's very effective. 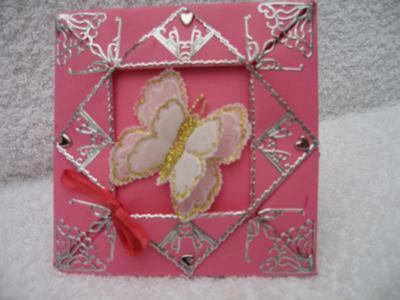 Although I have used butterflies, any thing, including your favourite photographs can be used. I love the combination of the black and gold Vonnie, it looks so rich. 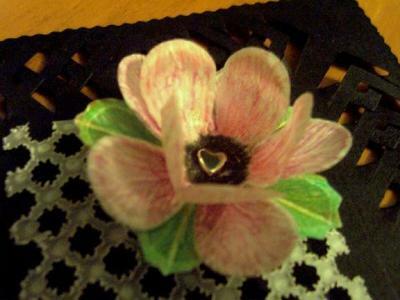 I thought I would try to make a flower look almost real in parchment, as that is the medium I like to use. I used a punch for the shape of the leaves, but the colouring and shaping of them was my work. I even tried to do the veins in the petals. Well at least it's not a butterfly this time. Parchment is always very beautiful, and I admire people with the patience to do it. This flower is lovely and I bet the rest of the card was just as good. This was a real challenge, the lacey surround was done from a pattern. It took me about 3 days on and off to emboss then cut out all the holes that make it lacey. 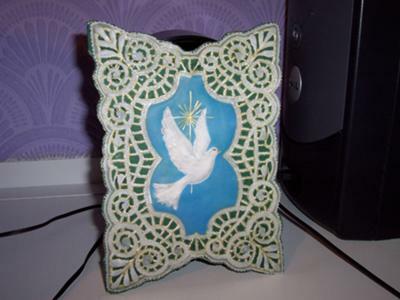 The dove in the centre is embossed and coloured with chalk. At the back of the dove I put some cotton wool to make it whiter and also so it was raised out from the lace, the effect was quite satisfying. The lace work on this card looks really intricate...you must have lots of patience to produce it. It's lovely, and thanks for sharing it.